Ganga Action Parivar has been working on a mission to clean the Ganga for the last five years. 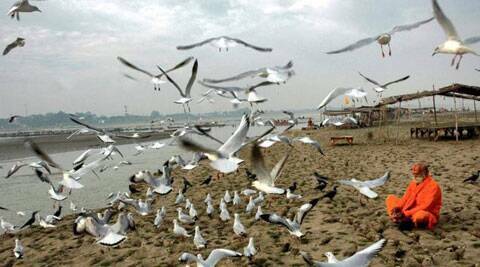 Lauding Prime Minister-elect Narendra Modi for his pledge to clean up the Ganga, the Rishikesh-based Ganga Action Parivar has offered its help in the effort while proposing to host a ‘Ganga parliament’ to highlight the urgent need to protect the river. Modi, who won the Varanasi Lok Sabha seat in the just- concluded general elections, has promised to clean the Ganga by 2019. While filing his nomination from the holy city, he had said it was the summons of ‘Mother Ganga’ which had brought him to Varanasi. “Nobody called me or sent me to Varanasi. My coming to Varanasi is like a child going to his mother. I have come to this divine land on the call of Ganga Mata,” he had said. Ganga Action Parivar has been working on a mission to clean the Ganga for the last five years and has now offered help to Modi to achieve this target. “Modiji’s pledge is crucial for India because, if the Ganga dies, India also will die. We are ready to help the Centre in this regard. I have had conversations with Modiji about Ganga in the past and was impressed by his determination to re-store Ganga to her pristine and free-flowing form. “I am looking forward to soon meeting him again over this,” Swami Chidanand Saraswati, the founder-President of GAP, told PTI from the USA. GAP brings together networks and partnerships of world’s leading researchers, environmentalists, engineers, religious bodies and business leaders for creating solutions to the numerous problems plaguing the Ganga. Saraswati said they are also planning to hold a Ganga parliament in Rishikesh soon in which Modi and MPs from the states through which the Ganga flows will be invited. “The time has come for a Ganga parliament… It would be aimed at inspiring valiant efforts to bring the entire river back to a clean and green condition. We are also making a new film of 543 seconds (one second for each MP) so that they may do a rethink on the issue,” Saraswati added. He also said that apart from a separate ministry for the Ganga, there should be powerful new laws and strong enforcement to ensure the river’s health. “There should be a committee working under the ministry which should include scientists, environmentalists and spiritual leaders. The National Ganga River Rights Act is already formed with the PM as the chairman and a Vice Chairman can also be appointed to look after the day-to-day plans and implementations,” he added. Till now, more than Rs 20,000 crore has been spent on cleaning up the Ganga, but without the desired results. Saraswati pointed out that the main hurdle has been a lack of political will and people’s attitude. “The main hurdle has been a lack of political will, which is resolved now after Modi’s pledge. We also have to change our mindset as cleaning up the Ganga needs collective efforts. “It should be a national priority to ensure that no sewage is ever allowed to enter the waters, and the banks of the Ganga should be made a green zone where only organic agriculture and zero-budget farming is allowed,” said Saraswati. Citing the example of the Thames in London, he said that it is not impossible to clean the river within the desired time-frame. “There was a time when the Thames was so polluted that it was equivalent to an open sewer, but today it is so beautiful. The clean-up of the Thames became the people’s mission and that is what we should do for the Ganga. I think it (Ganga’s clean-up) can be achieved within the desired time-frame provided that the people of India get involved,” he said. One of GAP’s main initiatives is the ‘Six-T’ programme, which provides a foundation for a cleaner, greener and more sustainable Ganga River Basin. “The six Ts are Toilets, Taps, Trash, Tracks, Trees and Tigers. Through a comprehensive and inter-linked programme, the people, animals and ecology of the watershed are enabled to not only survive but thrive,” he stressed.